Approaches to care coordination were similar in most of the reviewed studies (Table 2). Briefly, a care coordinator was assigned to the care receiver/caregiver dyad to conduct a structured assessment, develop a care plan, provide ongoing support, and monitor their progress. For example, in the intervention described by Callahan et al. (2006), dyads met with the care manager on a bimonthly to monthly basis for symptom assessments and evaluations, caregivers were invited to participate in group support sessions led by a social psychologist, and care receivers were encouraged to engage in group chair-based exercise classes. Generally a social worker, geriatric nurse practitioner, or nurse trained in dementia care. In addition to the care coordinator, this team may include primary care providers, occupational & other therapists, social workers, geriatricians, or psychologists/psychiatrists. Provides care to the dyad or support to the care coordinator. An interview, sometimes using specialized software; done in person at a clinic or at home or by telephone. Assesses the care receiver's health, functional & cognitive abilities, the home environment, supports in place, & the caregiver's needs & concerns. Evaluates whether specific services are needed, such as special equipment & adaptations, meals & other domestic help, respite services, adult day care, home care, & nursing home care. Generally a written plan specifying treatments over the course of a set time period. The care coordinator arranges care directly or refers patients/caregivers to providers. Monitoring to ensure the care plan is implemented. Often includes counseling, support groups, or other therapy for the caregiver. Care coordinators were also responsible for either referring care receivers to medical or LTSS providers or directly arranging these services. Care coordinators were typically social workers, geriatric nurse practitioners, or registered nurses trained in dementia care. Care coordination was undertaken by a variety of health and social service organizations, including managed care companies, primary care practices, mental health programs, nursing homes, specialty clinics, and home care programs. The most common measured outcomes were service utilization, time to institutionalization, caregiver stress and burden, depression, quality of life, cognition, behavioral symptoms (such as aggression), and functional ability. Ten programs coordinated both medical services and LTSS. One program focused on medical service coordination, and two programs focused only on LTSS. Two studies focused on coordinating LTSS. Influenced by the National Long-Term Care Channeling Demonstration of the early 1980s, the Medicare Alzheimer Disease Demonstration and Evaluation (MADDE) was an RCT that was designed to increase access to formal LTSS through care coordination and access to additional LTSS for people with Alzheimer's disease (Fox et al., 2000; Miller et al., 1999; Newcomer et al., 1999a, b). The study did not have an explicit goal of reducing nursing home entry (Miller et al., 1999). The care coordinators were responsible for linking participants with community-based services, providing psychological support, and managing costs within the budgeted amount for LTSS. Those in the treatment group were eligible for an 80 percent discount on community care benefits, up to about $600 per month. MADDE had the largest sample size of any study in this review, with 8,905 enrollees who remained in the demonstration for more than 30 days across eight United States cities between 1989 and1994. Implementation--the type of care coordinator and arrangement of services--varied across sites. Only one location directly attempted to change the use of medical services. Most caregivers in this intervention had baseline scores of burden and depression that were not considered clinically problematic, making it difficult to show significant improvements. Lam et al. (2010) evaluated care coordination for persons with mild dementia who were recruited from memory clinics at a teaching hospital in Hong Kong. The participants were randomized to either the intervention or control group. The 4-month home, clinic, and telephone-based intervention consisted of providing support, skills training, coordination of needed services, and referrals to local social services, led by an occupational therapist. The primary outcomes were caregiver burden and quality of life; secondary outcomes included changes in clinical measures (such as the MMSE) and use of care services, such as day care and home health. The limited availability of community LTSS and dementia training for domestic helpers were cited as issues affecting the intervention. All of the remaining ten programs coordinated both medical services and LTSS. 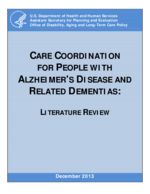 LTSS arranged by the care coordinators typically included day care, home care, social centers, and respite care. The involvement of health care professionals ranged from direct care coordination responsibilities to consultations as needed. The following four studies took place in the United States. The Rural Iowa Alzheimer's Demonstration described by Specht et al. (2009) provided nurse care coordination to individuals with a suspected memory impairment. Some of the study design issues that may have posed a challenge include a lack of confirmed dementia diagnoses, inconsistent follow-up times, and differences in outcomes measures at baseline. Three United States-based programs coordinated care for persons with dementia and their caregivers within integrated health care systems (such as Kaiser Permanente). The advantage of these programs was the availability of an integrated system which facilitated access to LTSS. The managed care environment--such as capitated payments, gatekeeping, and electronic medical records--already provided some coordination of the health care needs of the members, although they were not previously focused on people with Alzheimer's disease. The unique contribution of the interventions was to integrate LTSS into that preexisting health system. The Cleveland Alzheimer's Managed Care demonstration described by Bass et al. and Clark et al. was a collaboration between a local Alzheimer's Association chapter and Kaiser Permanente of Ohio to provide telephone-based care coordination for one year (Bass et al., 2003; Clark et al., 2004). Families were randomly assigned to either care coordination or usual care. Most of the care coordinators, who were staff of the Alzheimer's Association chapter, were social workers, and all services were provided at no cost to participants. In addition to persons with a specific diagnosis of dementia, individuals with a symptom code for memory loss were also included. The study excluded individuals with the most severe memory impairments. Although improvements were observed for both persons with dementia and their caregivers, the intervention mainly focused on caregivers. PDC was 12-month telephone-based care coordination collaboration, this time between the VA and local Alzheimer's Association chapters (AHRQ, 2012; Judge et al., 2011). Built on two prior studies (the Cleveland Alzheimer's Managed Care Demonstration (Bass et al., 2003) and the Chronic Care Network for Alzheimer's Disease (Maslow et al., 2001), PDC was a 5-year research investigation that tested the effectiveness of a telephone-based care coordination intervention designed to address the unmet care needs of veterans with dementia and their family caregivers across all dementia stages. The intervention included linkages between the VA and the Alzheimer's Association, delivery system redesign and decision support, self-management training, and the development of a clinical information system. The main delivery system redesign components were the addition of two new care coordinator positions at each organization: the VA's care coordinator, who focused on veterans' medical and nonmedical needs and assisted families with effectively using VA resources; and the Alzheimer's Association care consultant, who focused on needs of informal caregivers such as care-related strain and accessing non-VA resources. The program was conducted in Houston and Boston. Judge et al. analyzed selected data from the 93 families included in the analysis and reported that those who received the intervention were similar to the general VA population. There were no outcome comparisons made in the peer-reviewed journal article, but additional outcome data on this intervention were found on AHRQ's Innovations Exchange website (AHRQ, 2012). Vickrey et al. (2006) evaluated dementia guideline-based care coordination in primary care clinics for persons with dementia and their caregivers, who were randomly assigned at the clinic level to either the intervention or control arm. The intervention was an 18-month disease management program within a capitated system. The program involved explicit protocols whereby the representative from the LTSS agency would be notified if his or her services were needed and given access to the individual's care plan through Internet-based care coordination software. The following six studies took place outside of the United States, including Canada, the United Kingdom, Finland, the Netherlands, and France. The Early Home Care Program described by Chu et al. (2000) was a pilot project run by a large integrated health care system in Canada. The program, an 18-month home care intervention, targeted individuals with a diagnosis of early dementia. Participants were randomized to either the intervention group or a control group. The intervention group received case management, occupational therapy, physical therapy, social work, nursing, respiratory therapy, in-home and out-of-home respite, homemaking, personal care assistance, volunteer service, and psychiatric consultation. The intervention group received an average of 7.7 hours per month of care coordination services. The control group received an information packet on community resources. The primary outcome measures were caregiver burden and institutionalization. The Lewisham Case Management Scheme in the United Kingdom, described by Challis et al. (2002), incorporated a care coordinator (social worker) into a mental health team of doctors, nurses, psychologists, and occupational therapists. The intervention was a 2-year program in which clinicians were responsible for managing acute care needs and care coordinators were provided a budget to purchase LTSS for participants as needed. The limitations of this study arise from the observational design and the use of unmatched comparison groups for the evaluation of certain outcomes. The comparison group also had access to a mental health team, which may have attenuated the comparison. Eloniemi-Sulkava et al. (2001) evaluated a home-based nurse care coordination program for persons with dementia in Finland. Participants were recruited through a national dementia registry and were randomized to either the care coordination program or usual care. The intervention consisted of a 2-year nurse-led care coordination program to assist patients with arrangements for social services and medical care. Jansen et al. (2011) described a care coordination program led by senior nurses specializing in geriatric care in the Netherlands. The 1-year program targeted individuals with either early dementia or a greater than 50 percent risk of dementia based on common dementia measurement scales. Participants were randomized to either the intervention or usual care. The intervention consisted of geriatric nurses making home visits, writing a care plan (providing protocols for managing 30 problem areas), organizing family meetings, following up via telephone every 3 months, and referring families to other providers. Outcomes included a comparison between the two randomized groups on measures of care received, such as the number of home care hours per week and the number of respite care days. Meeuwsen et al. (2012), another study from the Netherlands, compared care coordination by a memory clinic to coordination by a general practitioner who was given guidelines on dementia care. These clinics are designed for the diagnosis and treatment of memory-related conditions. Participants were diagnosed with dementia but had scores of anxiety and depression that were below levels of clinical depression or anxiety. Scores of participant cognition and quality of life were also high at baseline. Meeuwsen et al. (2012) cited biases caused by attrition in the control group as a possible limitation. Finally, Nourhashemi et al. (2010) evaluated care coordination using a specific care plan in French memory clinics. The goal of the intervention was to incorporate biannual care coordination by the physicians in the memory clinics, with the main outcome measure being functional capacity of the patients; secondary outcomes included institutionalization rate and mortality. Participants with possible or probable Alzheimer's disease were selected based on standardized diagnostic criteria and an MMSE score of 1226. They described selection biases, issues of contamination, and a government initiative which encouraged more care coordination in memory clinics as possible explanations for their results.